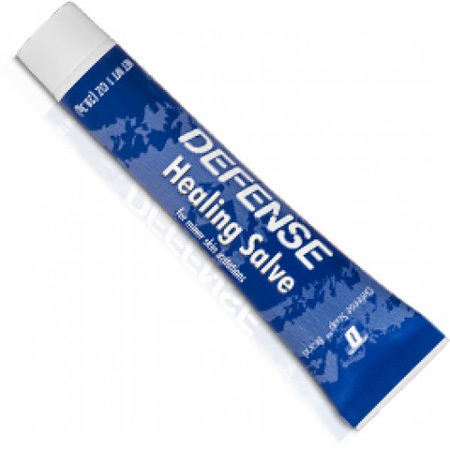 Defense Healing Salve (1 oz. ), is loaded with healing properties including vitamins A and E. This healing salve should be used in conjunction with Defense Essential Oil. The active ingredients (Tea Tree and Eucalyptus Oil) have been clinically shown to have anti-fungal, antibacterial and antiviral properties. The healing salve may also be used alone to aid in healing of mat burns, small scrapes and scratches suffered in practice. CONTAINS NO PETROCHEMICAL COMPOUNDS, TRICLOSAN OR SODIUM LAURYL SULFATE. NO HARMFUL SIDE EFFECTS.